Recently I came across William Martin’s The Parent’s Tao Te Ching: Ancient Advice for Modern Parents (1999, DaCapo Press), and I’ve been thinking about his remarks on the wisdom of encouraging our children to strive for extraordinary lives versus helping them find the wonder of an ordinary life and allowing the extraordinary to take care of itself. 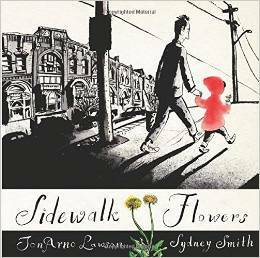 And then I read Sidewalk Flowers by poet JonArno Lawson and illustrator Sydney Smith. This beautiful book is a quiet tribute to the grace of small acts of kindness. In this wordless book, a little girl collects wildflowers while on a walk through town with her disinterested father. Her father is preoccupied, talking on his cellphone, while his daughter notices the world around her. The little girl quietly and without fanfare graciously gives her collected flowers away, and although her gifts are rarely acknowledged, she continues to leave her small tokens of love. The illustrations by Sydney Smith are soft and lovely and the story is presented in panels like a graphic novel, so the story unravels slowly and with exquisite beauty. Sidewalk Flowers is a testament to the wisdom of living an ordinary life in an extraordinary way. “Small things, small people, and small gestures.” Extraordinary. Sidewalk Flowers by JonArno Lawson and Sydney Smith, Groundwood Books, Berkeley, 2015, ages 4 to 7.